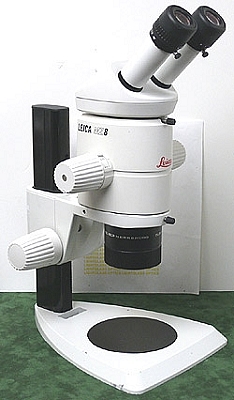 This Leica MZ8 Stereomicroscope on Leica Table Stand is in excellent condition, and has the Wild/Leica 1.0X Plan bottom objective mounted. This renders spectacular images- clear, flat, true color images that will give you results you can be proud of. It has Leica 10X/21 eyepieces and the zoom range with the way it is equipped is 6.3X to 50X, but being part of Leica's modular M-Series, you have a range of options- eyepieces up to 40X, bottom objectives from 0.5X to 2X, photo tubes, 2nd observer tubes and more. To find an MZ8 for sale is hard enough, and one this nice....harder still! Notice the position of the head on the stand- I have this focused on the black/whice Leica contrast plate to show you the large working distance under the objective of this microscope.